Litigating an Unlawful Detainer action has come out of the dark ages. In the past, jury trials for Unlawful Detainer were non-existent. Preparing for trial did not involve a lot of work. You would simply make sure the Eviction Notice was prepared correctly, served and you and your client showed up for your trial date to put on your case. Today preparing for jury trials in Unlawful Detainer cases in all of the Los Angeles Superior Courts is the norm rather than the exception. In 2018 you have far more eviction defense firms then existed even 10 years ago. Most, if not all of these eviction defense firms are funded by the Shriver Housing Project and other government grants. Many of these private eviction defense law firms practice what is known as “take no prisoner’s” litigation at no or very little expense to the tenant. The key to preparing for litigation in all evictions matters and in all other types of litigation is preparation, preparation and more preparation. In Unlawful Detainer litigation from the filing of the complaint to the trial date will take a matter of weeks. In all other types of civil litigation it generally takes 12 to 24 months to get to trial. That means you had better start preparing for the possibility of trial from the very inception of the tenancy by keeping good and adequate records in a tenant file. Once the Unlawful Detainer case is filed and served the Defendant has five to fifteen days to respond, depending on how the complaint was served to file a responsive pleading. Typically, a tenant responds to a landlord’s complaint by filing a legal document called an Answer. It’s often easy to tell when a tenant has had a consultation with one or more of the eviction defense firms because the answer will usually look the same. The two to three-pages Unlawful Detainer Form Answer to your complaint will have expanded to at least eight to twelve pages if the tenant has consulted with or has hired one of the eviction defense firms. The Unlawful Detainer Answer will deny the material allegations of the complaint and usually allege new matters called “Affirmative defenses” which will include the breach of the warranty of habitability, retaliation, violation of the Los Angeles Rent Control Stabilization Ordinance known as LARSO – and if in the Los Angeles Superior Court, discriminatory eviction, and many other affirmative defenses. The answer will also in most instances, include a demand for jury trial. This is when the major preparation for trial will begin. After reviewing an Unlawful Detainer Answer that is known to have come from one of the eviction defense firms the appropriate defense is to immediately begin preparing Form Interrogatories, Special Interrogatories, Request for Admissions, and Request to Produce documents. The primary purpose for sending these documents is to force the tenant to provide factual and documentary information about their defenses to the Unlawful Detainer case. A secondary purpose of sending out these types of documents is to try to force the defendant into a settlement posture because they do not want to invest the time into responding to the discovery. Many tenants don’t want to answer probing questions and would rather settle when they realize doing so may open other unexpected problems for them – and would rather avoid the Special Interrogatories and Request to Produce Documents because they feel it may cause other vulnerabilities for them filing these legal documents in a court of law. This is the unspoken reason why this is often very effective countering their claim. Generally, the tenant has seven days to respond to the discovery from mailing. Approximately 20 to 30 days after the discovery is sent out you will have been notified of a trial date. If the tenant has requested a jury trial, which is the norm in the Los Angeles Superior Court, you need to begin preparing for the trial. Preparing for trial in the Los Angeles Superior Court, whether jury or non-jury now involves preparing a witness list, exhibit list, a trial brief and a trial note-book containing the complaint and answer, witness list and exhibit list. Binders of the tabbed exhibits must be provided to the court on the day of trial. In jury trials we prepare jury instructions and many pre-trial motions called Motions in Limine, in additional to the witness lists, exhibit lists and trial brief. The Motions in Limine are an important part of our trial arsenal when appropriate. These motions can expedite the trial by forcing the tenant and/or his/her attorney to reconsider whether they really want to go to trial. The cost and time required to handle an Unlawful Detainer action from inception to trial has increased steadily in California over the past 10 years. This is due in large part to the proliferation of Eviction Defense Law Firms demanding jury trials and the budget cutbacks in the courts handling eviction matters. 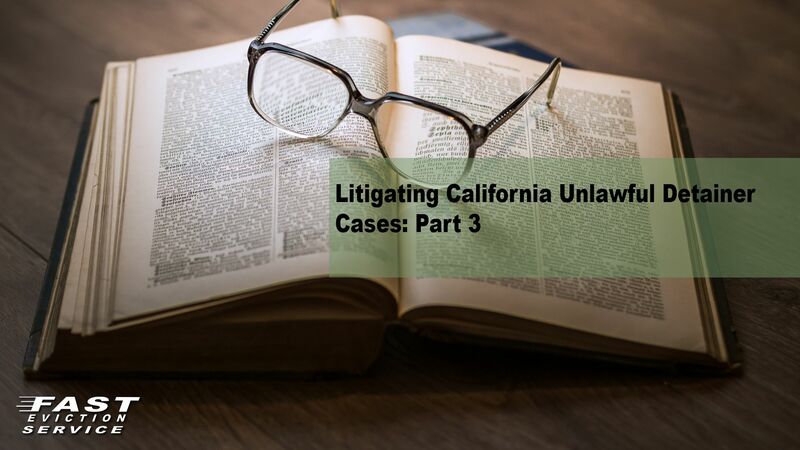 It is essential if you intend to successfully litigate a California Unlawful Detainer case that you fully understand the complexity of what is involved in the current environment and prepare accordingly or make expensive mistakes.